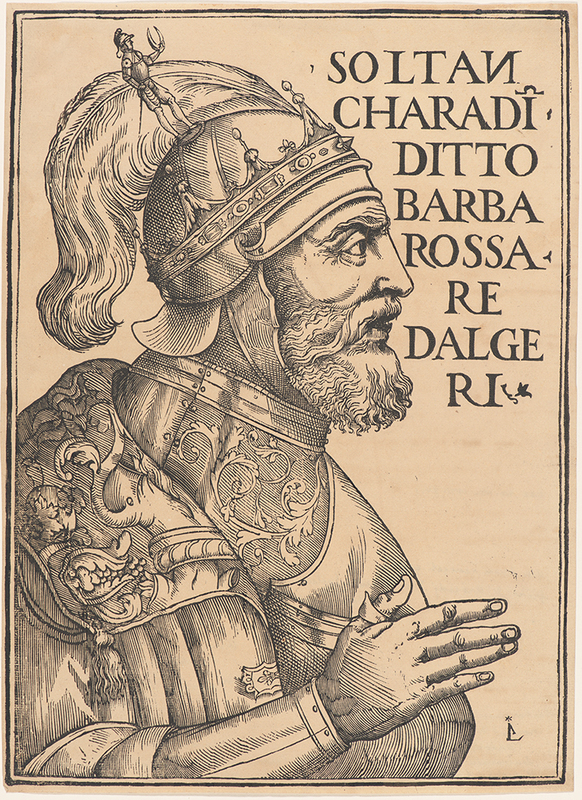 The image depicts Sultan Charadin, the son of a Greek renegade and brother of Aroudj Barbarossa. In 1518 he occupied Tunis, which was then ruled by the Ottoman Empire until 1535 when the Sultan Charadin was expelled by Emperor Charles V during his Tunisian campaign. Bibliography: Not listed by Nagler, Mon. (894, 895, 8998, 2683). Soltan Charadin, Barbarossa Re Dalgeri, . Woodcut on handmade laid paper. Image: 350 x 256 mm (13.8 x 10.1 in.). DAC accession number 1971.34.1. Purchase funds, 1971. Open Access Image from the Davison Art Center, Wesleyan University (photo: M. Johnston). http://dac-collection.wesleyan.edu/obj6143 is a persistent link to this page with no user-session information.